There is nothing quite like a chocolatey, chewy cake-inspired cookie to satisfy your sugar cravings. Topped with a decadent spread of cream cheese frosting and tart berry compote, this cookie, with its beautiful complimentary colors, will capture attention as people browse the dessert table this holiday season. Just one bite and you will already be wondering when you can have another. Preheat oven to 350ºF. In a large mixing bowl combine flour, salt, cocoa, powdered sugar, white sugar, and brown sugar. Using a pastry blender, cut in the butter. Set aside. In a small bowl, whisk to combine egg, cream, vanilla, and honey. Add to flour mixture and stir to combine. Add melted chocolate, stir well. Scoop into balls by the tablespoon and place on an ungreased baking sheet. Bake for 10-12 minutes. Remove to cooling rack. Using a stand mixer or handheld mixer, beat cream cheese, butter, brown sugar, and vanilla until just combined. Slowly add powdered sugar and mix until smooth. In a saucepan over medium heat, combine mixed berries, sugar, lemon juice, orange juice, and salt. Bring to a simmer, stirring regularly. Add butter and allow to simmer for 10 minutes. Remove from heat and allow to cool. Once cookies and compote have cooled, assemble cookies. 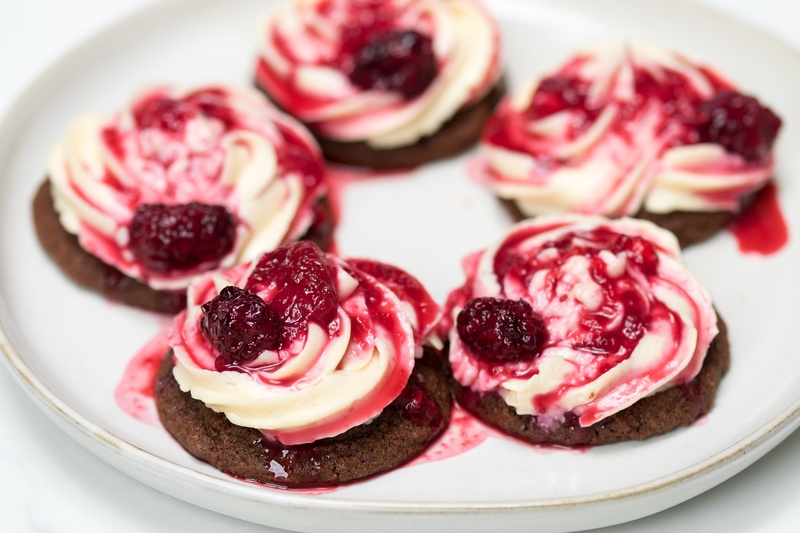 Frost cookies with desired amount of cream cheese frosting and spoon berry compote onto center of cookie. Serve immediately. Note: If preparing for a gathering, assemble ingredients and store individually. Bring components and either assemble onsite or set up to allow for guests to assemble themselves.